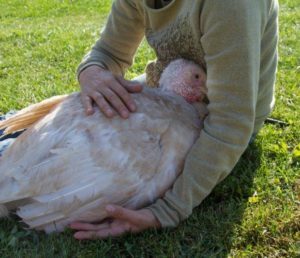 Let’s give thanks to Adam, Deb, John, Krista, and Martha for coming out to express their compassion and sorrow for turkeys today (and thanks to Lyn for stopping by to give us hugs). The rain held off but the wind kept us company, and the temperature dropped from pleasant to not-so-much in the 80 minutes we were there on the corner of East and Winton silently holding signs expressing sadness at the deaths of 45,000,000 unique individuals. Grief is an act of protest that declares our refusal to live numb and small.